Hi everyone! I hope you all had a great weekend! Are you ready for Christmas or will you be doing some last minute shopping like me? After my Holiday Penguins, I suddenly wanted to do something more spring like. I suppose I’m already anticipating the arrival of the spring since it’s been really snowy and cold where I live. 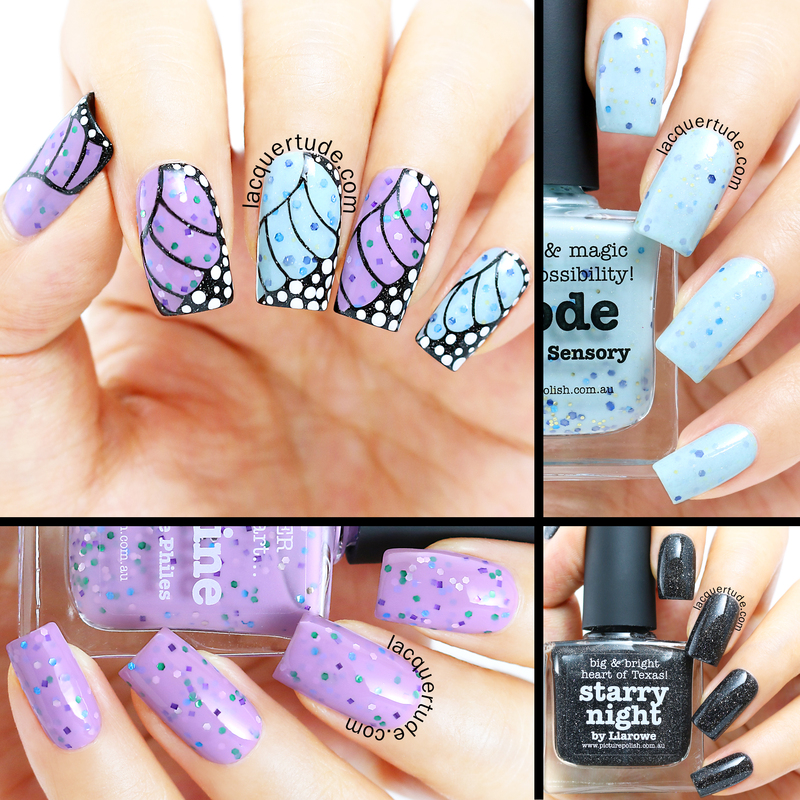 So, what’s more perfect than beautiful, ethereal and delicate Fairy Butterfly Wings nail art?! Let’s take a look at my swatches of the 3 gorgeous piCture pOlish colors that I used to create my nail art. Starry Night is a gorgeous black base filled with piCture pOlish signature holographic particles. This was created in collaboration with the amazingly talented Leanne, shop owner of Llarow.com who also has a very successful nail polish line of her own. My nails look like the midnight sky dazzled with millions of stars. If you’ve always been intrigued by black polishes but find solid cream blacks too stark for your taste, then Starry Night is your answer! It’s sophisticated yet edgy, classy and mysterious. It could easily pair with any even gown or cocktail dress. The first coat was quite sheer, but the second coat reached perfect opacity with smooth and flawless application. Another bonus, the polish itself is so glossy that you’re looking at my manicure here without any topcoat! Macro texture shot. Speechless… Macro texture shot so you can see the glitter details. 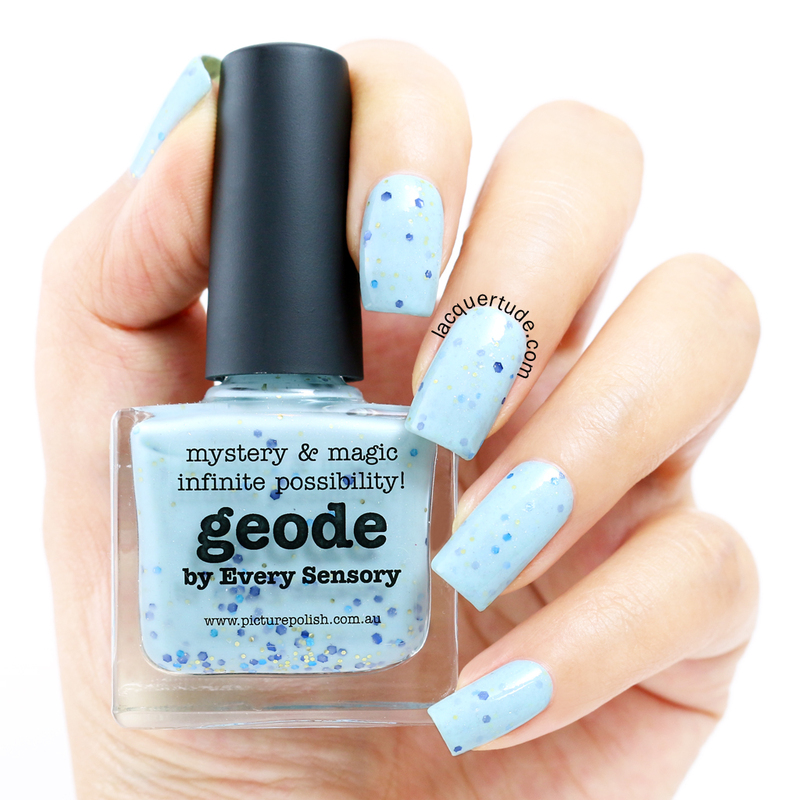 Geode is another collaboration shade created with Ami from Every Sensory. The polish is named after the stones with the same name. The light blue base is quite similar to piCture pOlish Sky, but with lots of medium blue, navy blue, small gold hex glitters and a soft golden shimmer that sets it apart. The formula was nice and smooth, but I needed 3 coats to reach full opacity. You can read more about this shade from the original creator here. Last macro texture shot. Can you see the small gold hex glitters and the golden shimmer? 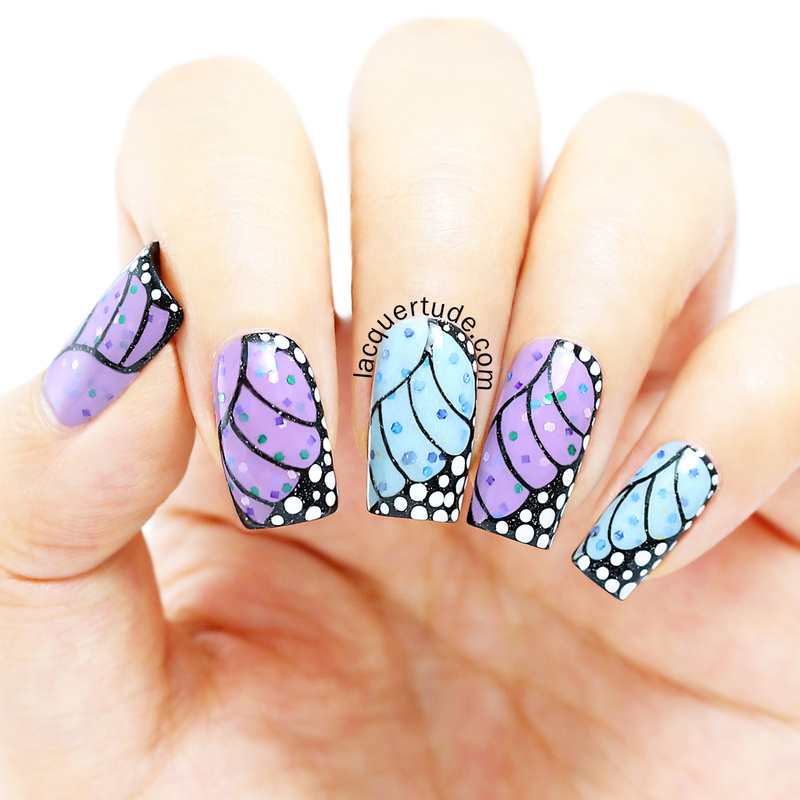 Here’s a large shot of my Fairy Butterfly Wings nail art. I think that the texture of all three polishes I used helped make this look spectacular. The base color of Jasmine and Geode are perfect for wings. Then, the various colored glitters really convey the “fairy” part of the look, sort of like fairy dust/particles that I would image a real fairy creature would have. On top of it all is the Starry Night, with its gorgeous holographic particles that symbolize the iridescent shimmer on real butterfly wings. The wings were hand painted using BornPrettyStore nail art brushes that I purchased recently. They work really well. I will be writing up a review post in the new year. As an added step, I loved the glitter look so much that I placed some extra ones on top of the polish after I had drawn the wings in. Finally, I sealed in my design with my trusted HK Girl Glisten & Glow top coat to protect my wings. What do you think? This must be the most girly nail art I have ever done to date. Do you like it? Thank you so much for reading and happy Holidays! Sooooo pretty! Love the colors you chose! girrrrrrrlllllll…you need to be hired STAT by every company ever to do product shots for them! you’re amazing. seriously. I just love this design. So superb!! !